The campfire burns. It’s 9:08. I feel so good cuz I just ate Two graham crackers, and chocolate, too, With marshmallow turned to warm, white goo. A treat indeed, a dripping mess. A touch of melty joy — oh yes! It’s bedtime soon, but I’m not done. I simply cannot stop at one. 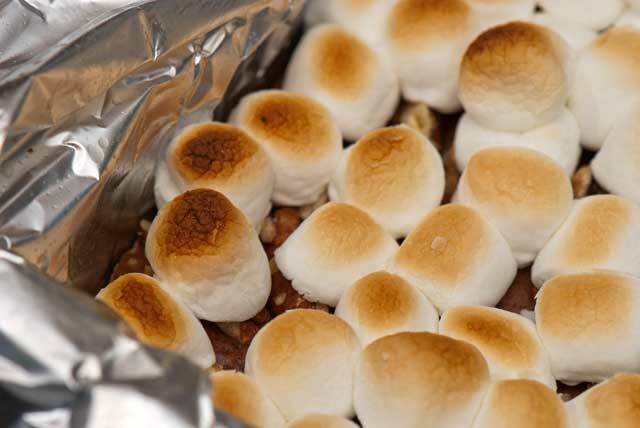 Because, you see, it takes three s’mores To make a night of happy s’nores. 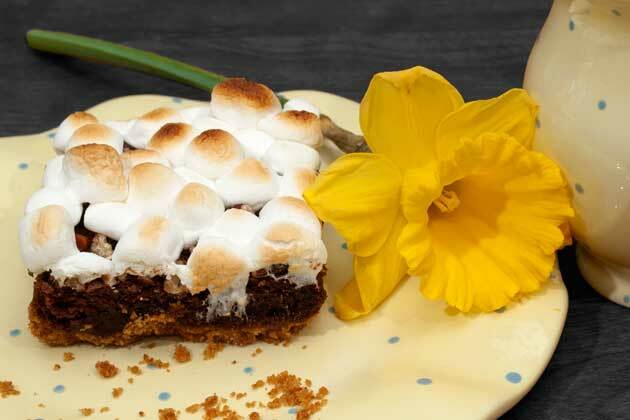 As a girl scout, s’mores were a treat we all looked forward to at the nightly campfire. 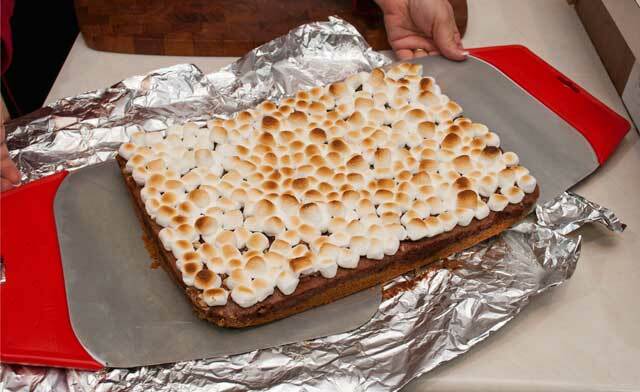 We each assembled our graham cracker, chocolate bar, toasted marshmallows and another graham cracker on top, in a piece of aluminum foil. Our packets were placed on the bright orange embers for just a minute or two. 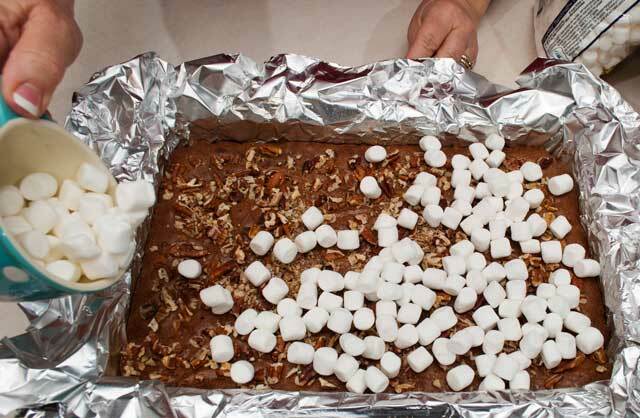 When our packet was unwrapped, the melted chocolate and gooey marshmallow made our day. With summer campfires just around the corner, I researched the history of this cookie. I discovered that August 10th, in the United States, is National S’mores day. Who knew? 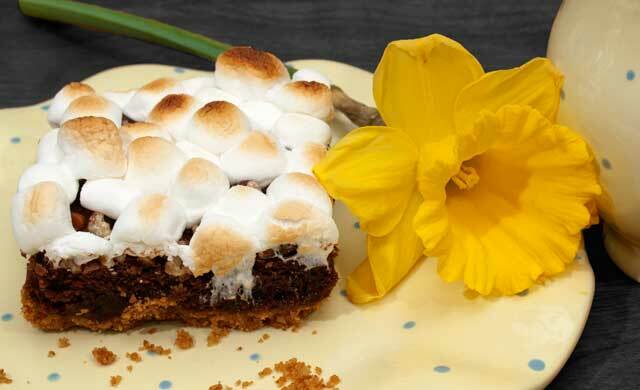 The first recorded version of this dessert is found in the publication, “Tramping and Trailing with the Girl Scouts” in 1927. 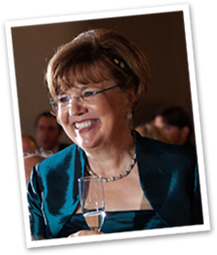 One of my cookie cookbooks is entitled “Cookie Swap” by Julia Usher. It is an amazing collection of decorated cookies that take your breath away. The cookies are works of art. 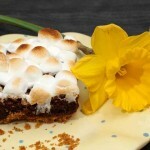 In this cookbook, Julia has a recipe for S’mores Bars that has been a favorite of mine. Line a 9 x 13” pan with aluminum foil, leaving a 1” overhang along the top of the pan. 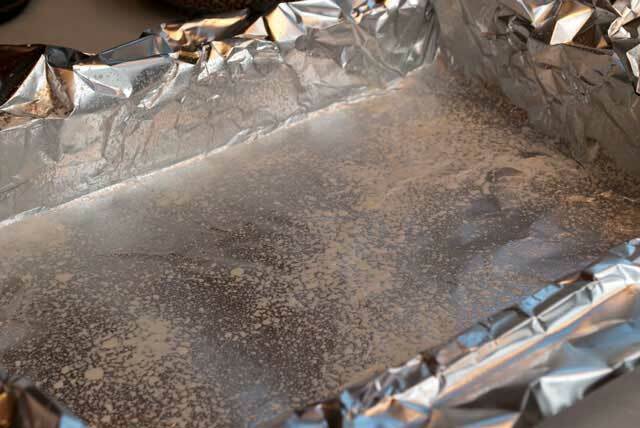 Smooth out any wrinkles in the foil and spray with a non-stick cooking spray. Set aside. Preheat the oven to 350 degrees while positioning a rack in the center of the oven. 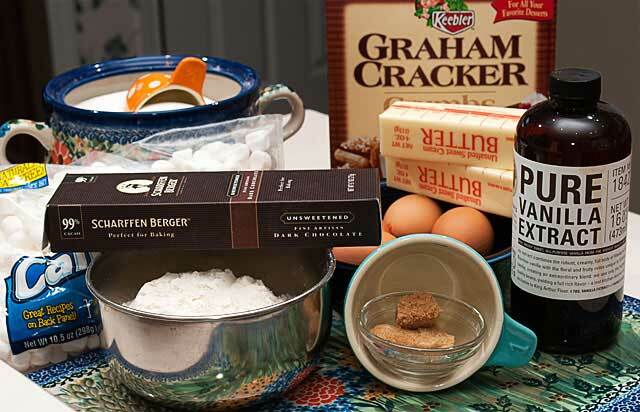 Combine the graham crackers and sugars in a bowl. Add the melted butter and stir until well combined. Press the mixture, into the prepared pan, in an even layer. Press down with the bottom of a glass. and the butter in a large bowl that will fit on top of a pot with boiling water (double boiler). 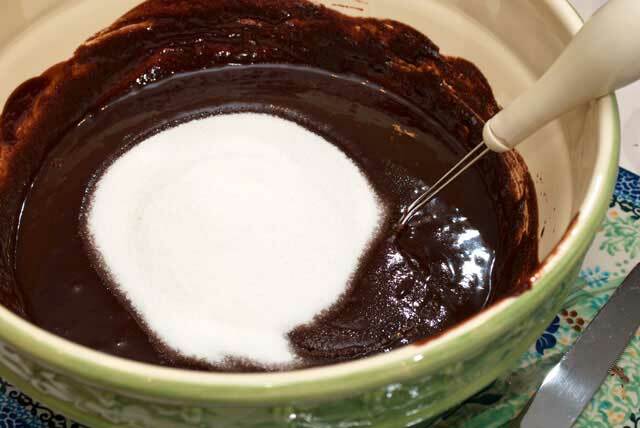 With the bowl over the simmering water, melt the chocolate and butter. Remove from the heat and whisk in the sugar. Stir in the flour, mixing until smooth. 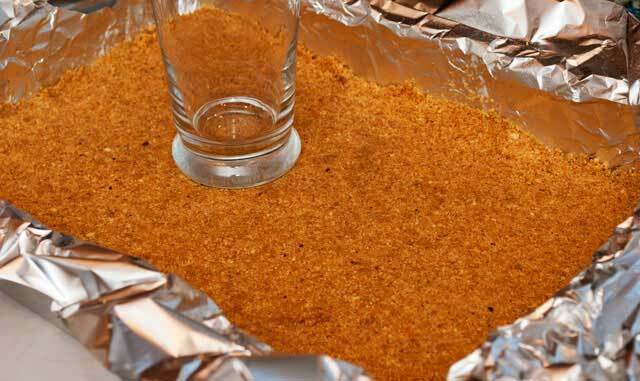 Pour the batter over the graham cracker crust. Level with an offset spatula. 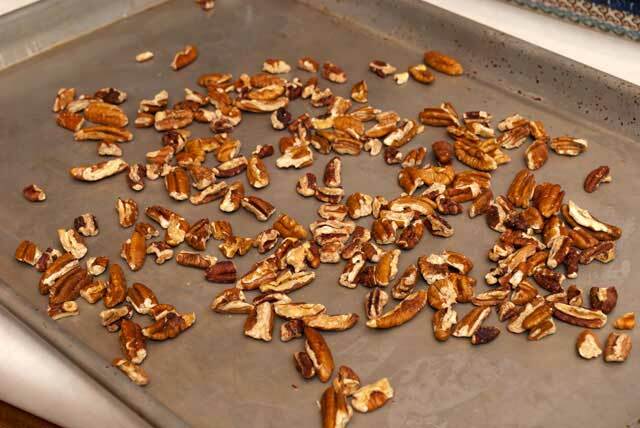 Toast the nuts in a 350 degree oven for 8-10 minutes. Coarsely chop the nuts. Scatter over the chocolate filling. 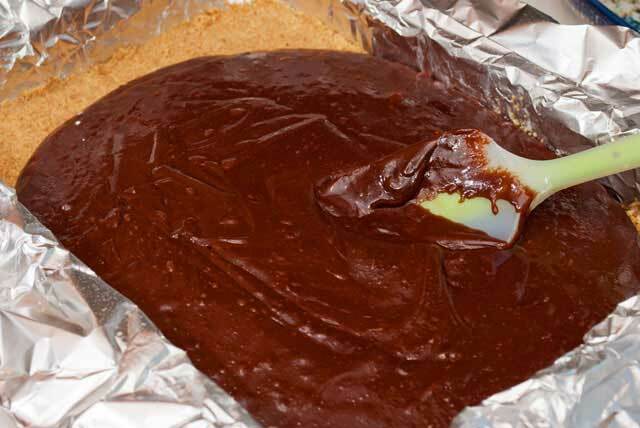 Bake for 30 – 35 minutes, or until a cake tester inserted into the batter comes out with damp crumbs on it. Do not overbake. Cool completely. Sprinkle the marshmallows evenly over the top of the cookies. 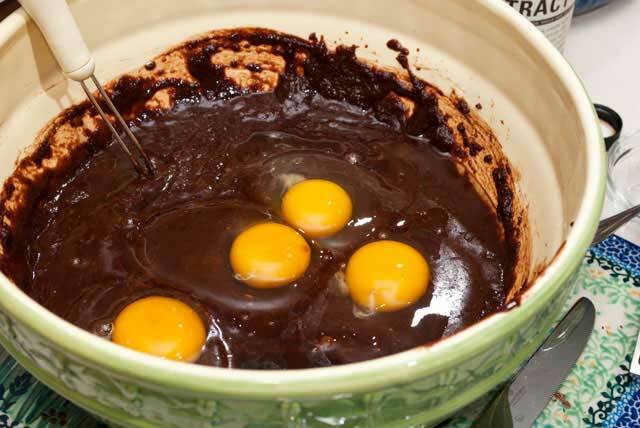 Place the pan under a broiler for about 1 minute, or until the marshmallows are puffed and golden. Remove the cookies by lifting up the foil overhang. 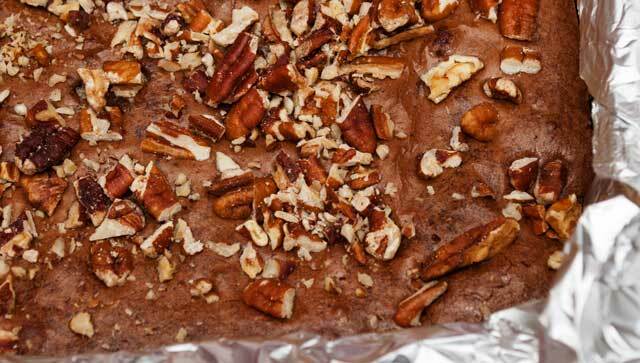 Place on a cutting board and gently remove the foil. Trim the edges, and cut into 2” squares. For the neatest cuts, use a sharp knife wiped clean with warm water in between cuts. From Cookie Swap by Julia Usher, pg. 88-89. 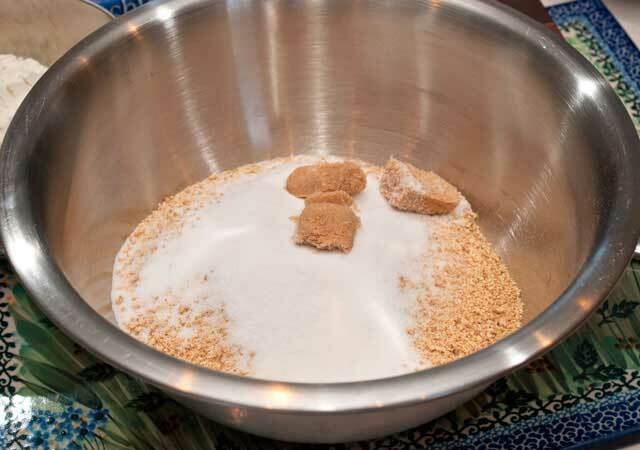 Combine the graham crackers and sugars in a bowl. Add the melted butter and stir until well combined. Press the mixture, into the prepared pan, in an even layer. Press down with the bottom of a glass. 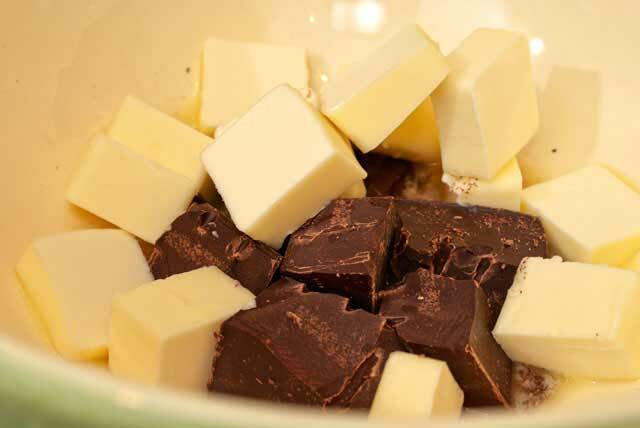 Combine the chocolate and the butter in a large bowl that will fit on top of a pot with boiling water (double boiler). 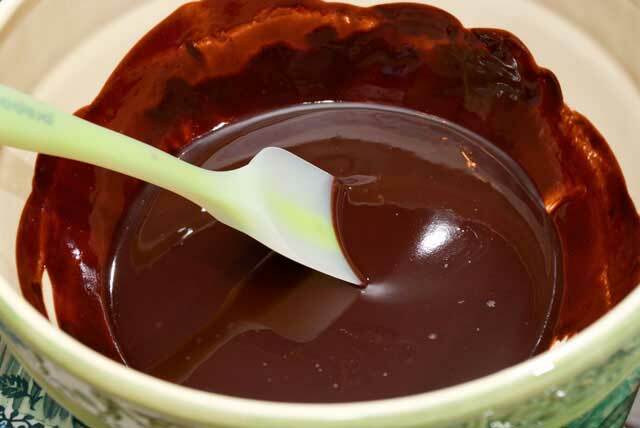 With the bowl over the simmering water, melt the chocolate and butter. Remove from the heat and whisk in the sugar. Beat in the eggs and vanilla extract. Stir in the flour, mixing until smooth. 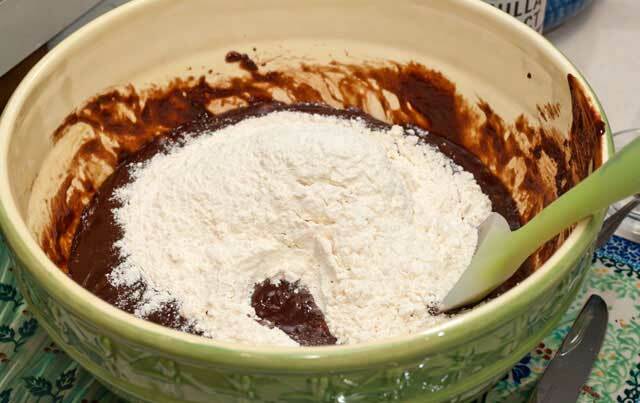 Stir in the flour, mixing until smooth. Toast the nuts in a 350 degree oven for 8-10 minutes. Coarsely chop the nuts. Scatter over the chocolate filling. Sprinkle the marshmallows evenly over the top of the cookies. 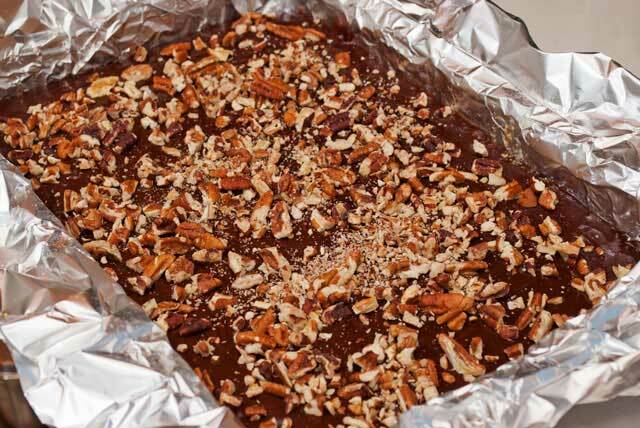 Place the pan under a broiler for about 1 minute, or until the marshmallows are puffed and golden. Thanks to Ashley I got the chance to enjoy these smores at work and have to say these were some the best smores I’ve had! Definitely going to be making them at home. Thank you for the recipe. Thanks for taking the time to comment. I’ll send more goodies in with Ashley for future taste testing. These are incredilble! Be careful not to eat the pan. Thanks for taking the time to comment. I’m glad you liked them. Oh, I’ve got to try these! They look fantastic! The chocolate filling is so dense and rich that I’m sure you will love these. These are amazing, I loved them! Can’t wait to make some of my own!